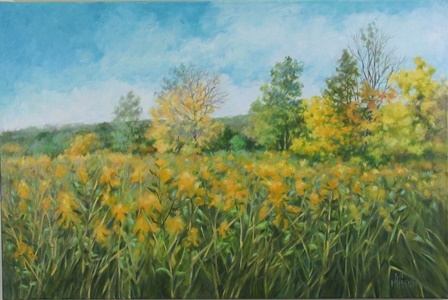 Original Oil Paintings by Artist Suzanne Poursine Massion - "Goldenrod Morning"
"A distant ridge touches the cloudy blue sky, sugar maples have turned a glorious yellow, and I am standing waist deep in a field of tall goldenrod. It's late summer, a very early morning. Life just couldn't be better."